Learn more about the vortex flow meter principle. The FV101 Series comprises in-line flow meters that use the vortex shedding measuring principle. The fluid strikes a bluff body, imparting alternating vortices downstream of the bluff. This creates a pressure on a sensor body containing a piezoelectric crystal. The frequency of the sensor is proportional to the velocity of the fluid and is amplified and converted to a 4 to 20 mA output signal. Vortex technology yields a meter with no moving parts to hang up or wear. The meter has a bright 7.62 mm (0.3") high LED display of flow in either liters or gallons. The FV101 Series can be used with non-viscous, clean, or dirty waterlike liquids that are compatible with brass, PVDF, and FKM. Measured fluids should not contain long fibers or a high level of abrasive solids. 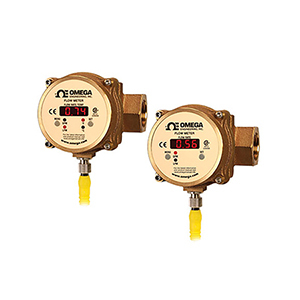 These meters are ideal for cooling loops using water or 50% glycols, and for water-soluble machine coolant (up to 10%). These applications are found in most process industries, including rubber, steel, fabrication, manufacturing, refining, paper, chemical, food, petrochemical, and power. Do not use on flammable liquids or on gases such as air. 참고: Comes complete with operator’s manual. Flow-only models come with 1 m (3.3') cable. Flow/temperature models come with 2 m (6.5') cable.